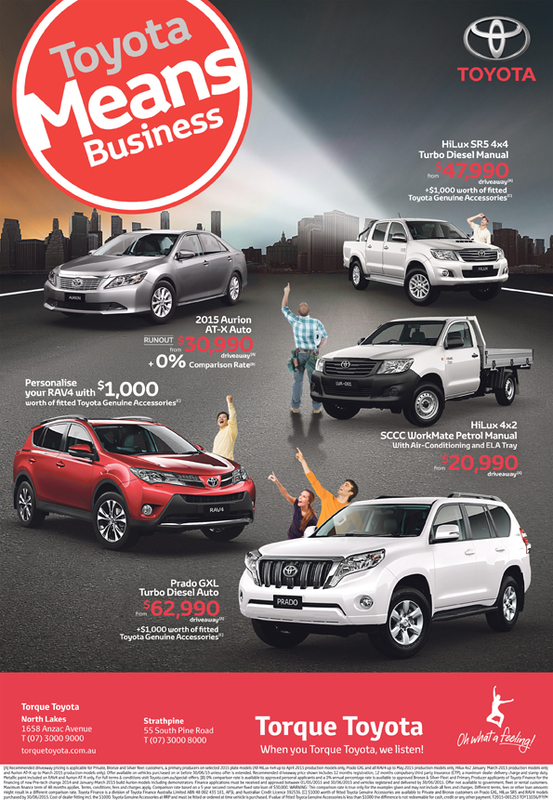 Toyota Means Business is on again at Torque Toyota. Australia’s No 1 Auto Event – ‘Toyota Means Business’ – is taking place from now until 30 June. It is a great opportunity to get into a new Toyota before the End of Financial Year and to benefit from even better discounts across a wide range of Torque Toyota vehicles. [A] Recommended driveaway pricing is applicable for Private, Bronze and Silver fleet customers, & primary producers on selected 2015 plate models (All HiLux 4×4 up to April 2015 production models only, Prado GXL and all RAV4 up to May 2015 production models only, Hilux 4×2 January March 2015 production models only and Aurion AT-X up to March 2015 production models only). Offer available on vehicles purchased on or before 30/06/15 unless offer is extended. Recommended driveaway price shown includes 12 months registration, 12 months compulsory third party insurance (CTP), a maximum dealer delivery charge and stamp duty. Metallic paint included on RAV4 and Aurion AT-X only. For full terms & conditions visit Toyota.com.au/special-offers. [B] 0% comparison rate is available to approved personal applicants and a 0% annual percentage rate is available to approved Bronze & Silver Fleet and Primary Producer applicants of Toyota Finance for the financing of new Pre-tech change 2014 and January-March 2015 build Aurion models including demonstrators. Finance applications must be received and approved between 01/05/2015 and 30/06/2015 and vehicles registered and delivered by 30/06/2015. Offer not available to government, fleet or rental customers. Maximum finance term of 48 months applies. Terms, conditions, fees and charges apply. Comparison rate based on a 5 year secured consumer fixed rate loan of $30,000. WARNING: This comparison rate is true only for the examples given and may not include all fees and charges. Different terms, fees or other loan amounts might result in a different comparison rate. Toyota Finance is a division of Toyota Finance Australia Limited ABN 48 002 435 181, AFSL and Australian Credit Licence 392536. [C] $1000 worth of fitted Toyota Genuine Accessories are available to Private and Bronze customers on Prado GXL, HiLux SR5 and RAV4 models purchased by 30/06/2015. Cost of dealer fitting incl. the $1000. Toyota Genuine Accessories at RRP and must be fitted or ordered at time vehicle is purchased. If value of fitted Toyota Genuine Accessories is less than $1000 the difference is not redeemable for cash, credit or any other payment. T2015-001253 TOY11036/FP/M.